Tarzan is a man raised by apes. The Apes on the Planet of the Apes are apes raised and living as humans. There's a natural symmetry to both that makes each seem like opposite sides of the same coin, so it only makes sense to bring them together. 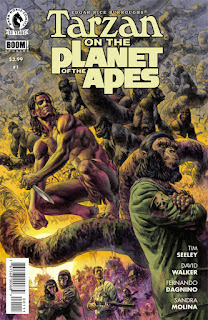 In Tarzan on the Planet of the Apes #1 from Dark Horse Comics, the two properties are thrust together. The issue is written by Tim Seeley and David Walker, illustrated by Fernando Dagnino and colored by Sandra Molina. Raised as brothers but separated by slave traders, Tarzan and his ape brother Caesar reunite when the war between man and ape takes them from the jungles of Africa to the center of the earth. Seeley and Walker take an interesting approach in Tarzan on the Planet of the Apes #1 in that instead of bringing the Apes to Tarzan's world (or vice versa), they mash everything up. In fact, there's some pretty heady time-traveling, universe-altering going on Tarzan on the Planet of the Apes #1 that requires the reader to soak it up. Seeley and Walker infuse the book with dialogue that taps into the Planet of the Apes universe more than anything, drawing Tarzan in as the traditional human raised by apes. Pitting Tarzan against the apes would be enough for a book to work, but Seeley and Walker throw in one more wrinkle with another antagonist of Tarzan's who will surely antagonize the apes as well. It's an interesting triangular conflict that can easily work. Dagnino illustrates Tarzan on the Planet of the Apes #1 with an attention to making the apes seem human and Tarzan seem like an ape. Where Dagnino excels though is that despite the aforementioned attempts, he still manages to make each feel like the other in a way that doesn't stretch logic any more than necessary. For instance, Tarzan is illustrated like a strapping young man who could swing from tree to tree, but doesn't have an exaggerated anatomy to make him too much like an ape. Dagnino also does a great job of filling out the jungle with all manner of creature both big and small--all of whom could easily kill on a moment's notice. Molina gives the book an appropriate jungle feel by filling out the illustrations with lush greens, inky blacks and peach flesh tones for distinguishing man from ape. Bringing together Tarzan with the Planet of the Apes seems like a no-brainer and Tarzan on the Planet of the Apes #1 is a great mix of the two properties. Tarzan will no doubt trade blows with the Apes throughout and how the battle shakes out remains to be seen. Seeley and Walker took a somewhat unconventional route in Tarzan on the Planet of the Apes #1 that makes a lot of sense by the end of the issue. Dagnino does a great job with the artwork in making the book feel both prehistoric and colonial at the same time, tapping into both universes. Tarzan on the Planet of the Apes #1 is a pretty strong first issue that may require a couple of readings to full take in what's going on. Tarzan on the Planet of the Apes #1 is in stores September 28.